Weeknights are usually hectic around here. I simply don’t have the time to spend my busy nights stuck in the kitchen. I’m always looking for fast meals and salmon is one of the best choices for a quick meal. It doesn’t take long to cook, full of Omega-3s, and just darn tasty. The classic combination of dill and mustard goes perfectly with the salmon. Heat 1 Tbsp of oil in a large skillet over medium-high heat. Sear the salmon for 3-4 minutes per side or until cooked through**. Remove the salmon and keep warm. Add the broth and dill weed. Scrape the bottom of the pan to release the browned pieces. Cover and let reduce for about 3-4 minutes. Add the Dijon mustard, stir to combine, and heat through. 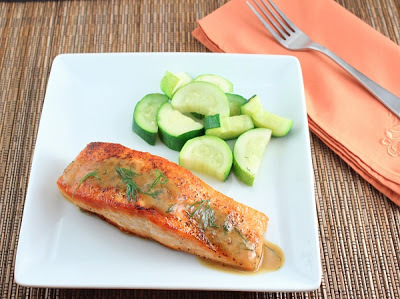 Serve the sauce over the salmon filets.Served with zucchini. **If the salmon is not cooked through are 3-4 minutes per side add the broth and dill to the skillet, cover, and cook until the salmon is done.